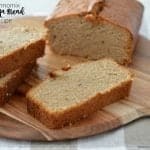 Love Banana Bread? This easy Banana and Raspberry Loaf will become your new favourite recipe! We’ve had a sad and lonely packet (well about a 1/3 of a packet!) of frozen raspberries floating around our freezer for the past few months now so a couple of weekends ago, I decided to finally use them up to get rid of the pack! 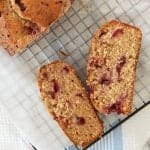 I decided to add them to our favourite Banana Bread recipe which I make each week (yep, seriously) and I was pretty confident the boys would enjoy it given they had been stealing frozen raspberries from the open pack in the freezer! Everyone in the house gave this loaf a big tick of approval, and it didn’t last more than two days – yep we have no will power! Thankfully this recipe is freezer friendly, so next time I will be popping half of it in the freezer to grab as an easy snack when needed. The boys enjoy a slice of this loaf for their afternoon tea, but it’s also great as a lunchbox treat (I just put half a slice in for Mr 6) and I’ve got to admit I ate the last of it when I had a rare moment of peace last week and it was just brilliant toasted under the grill and then covered in butter! Preheat your oven to 160 degrees and lightly grease a 20cm x 10cm loaf tin. In a large mixing bowl, add the self raising flour, cinnamon, caster sugar and brown sugar and stir to combine. Make a well in the centre. Add the eggs, coconut oil, vanilla extract and mashed banana to the dry ingredients and mix together until just combined. Add the raspberries and gently fold through to combine. Pour the mixture into the prepared loaf tin and bake for 55 - 60 minutes or until the banana and raspberry loaf is cooked through when tested with a wooden skewer. Preheat your oven to 160 degrees and line a large loaf tin with baking paper. Place the eggs, oil, vanilla extract and bananas (which have been quartered) into your Thermomix bowl and mix for 15 seconds on speed 6 to combine. Scrape down the sides of your Thermomix bowl and mix for a further 5 - 10 seconds on speed 4 if the mixture hasn't quite combined. Add the self raising flour, cinnamon, caster sugar and brown sugar to your Thermomix bowl and mix for 10 seconds on speed 5. Scrape down the sides of your Thermomix bowl and mix for a further 5 seconds on speed 5. Add the raspberries and gently fold through with your spatula. You will find more great cake recipes in our ‘Cakes and Cheesecakes‘ eBook – Also available in a Thermomix version. You can shop all the print and eBooks here.